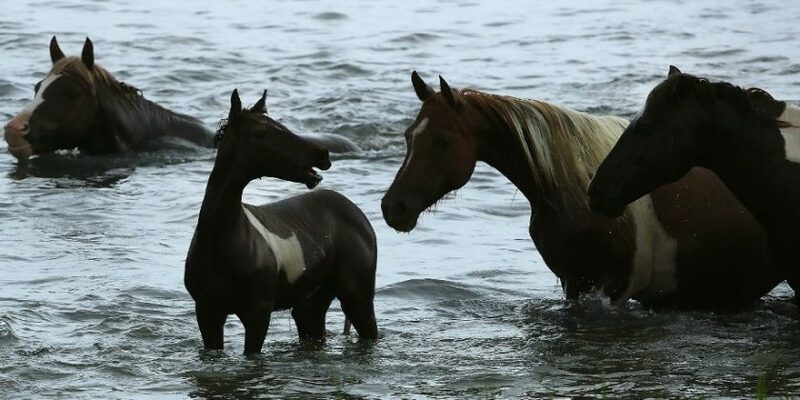 The wild ponies of Chincoteague and Assateague Islands have grazed on the land of the barrier islands for centuries, but now the herd has been fighting a fungal disease some are referring to as swamp cancer. Over the last year, a number of horses have had to be euthanized, but now the Chincoteague Volunteer Fire Company, which manages the herd, has brought in a team of veterinarians to fight the disease. CNN says that with the colder weather, the disease that is striking down the beautiful wild ponies seems under control, but many are fearing the hot and humid weather when the swamp cancer seems to flare up as the organism which causes it grows and spreads on dead and dying grass and plants. Supporters of the herd are hoping for a vaccine which would prevent the disease and more effective treatments and ways of catching it early, which right now seems to be the key. Darcy Cole, a local photographer who spends around 300 days a year photographing the animals that most people believe came over with the earliest Spanish colonists, says that catching the disease early seems to be the key to whether the horses can be saved. Because Cole spends so much time observing and photographing the wild ponies, she has been able to notify their caregivers when she notices a change. At this time, the herd, which numbers around 150, seems healthy, but Denise Bowden, the spokeswoman for the fire company, says they are concerned about the warmer months. The origin of the disease seems to start with pythiosis, which starts with lesions on the legs of the ponies and ultimately harms their immune system. Traditionally, in the past, this has only been a problem in Latin America and the Gulf states. Dr. Richard Hansen is a researcher whose company is working on a vaccine and enhanced immunotherapy to fight the infection, and he says that the wild ponies are easy targets due to their long hair and cuts on legs and torsos. Dr. Allison Dotzel believes that they only thing to do is get ahead of it.